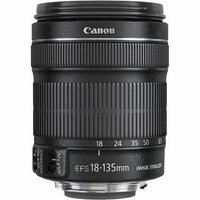 The Canon EF-S 18-135mm f/3.5-5.6 IS STM is a versatile zoom lens that uses STM (stepping-motor technology) to ensure quiet, smooth focus operation. The built-in 4-stop Dynamic Image Stabiliser (IS) allows you to shoot sharp images handheld and shake-free movies. It uses ultra-low dispersion (UD) lenses, aspherical lens elements, and lens coatings to ensure ghosting and flare is kept to a minimum.